The alarm sounded, reminding us to once again get up and check on the pregnant ewes. As I walked into the field I could see that things had moved on and a further two lambs had just been born. I was a little confused though. Badger was cleaning up both of the lambs and Number 25 was also cleaning up one of the lambs. Now I just had to work out who belonged to who. After a few minutes moving them all into the lambing pens and observing things, I got to the bottom of it. The twin girls were in fact both Badgers’, but Number 25 was in labour herself and apparently she wanted to assist her friend in the clean up operation of her lambs. Without much of a break, and with strong winds and rain now upon us, Number 25 gave birth to another girl and very soon after we had yet another delivery, a beautiful grey and white patched girl. It was late afternoon, the delivery ward was empty and then Number 23’s labour began. 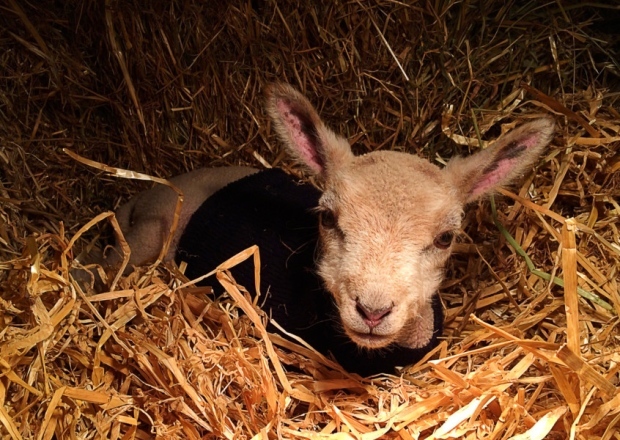 After a couple of hours she was struggling and her lamb’s nose and toes hadn’t hardly moved at all. It was time to intervene and each time she had a contraction and started pushing I would take hold of the lamb’s legs and pull, all the time being aware that I didn’t want to dislocate anything in the process. Ultimately, brute force did the trick and the lamb’s legs, which somehow had been trapped, were pulled free and out she slipped like an ice pop on a summer’s day – what a whopper she was too. Wendy, took the tea off the stove and hurriedly came out to see the newborn. As she walked past the shelter she noticed that one of Delilah’s twins looked listless. She picked her up and she was cold, it was clear that she hadn’t been feeding and her temperature had dropped. I wrapped the little one in my jacket whilst Wendy ran back to the house to make up a bottle and to get blankets to wrap her up. I called the vet, Andrew from Wicstun, and minutes later he was out in the field establishing that mum had mastitis and the lamb had hypothermia. Both of the lambs were soon wrapped up by our stove and things looked like they were turning a corner, with the poorly lamb now feeding from a bottle. Our vet loaned us a heat lamp and a pen was built inside our barn for Delilah and her twins, where the heat lamp could be sited and they could all be kept together in the warm. Our only other challenge was then getting Delilah out of the field into the barn, while all the time she was frantically chasing around the field looking for her babies. After an hour-and-a-half I had her cornered, in the shelter. Everyone in there made a hasty exit, except Delilah and me, and one rugby tackle later I had her. I then tried to call home for assistance, but my phone battery died – typical. I pulled her out of the shelter, got off my knees and carried her into the barn. Very soon the family were reunited and we checked on them through the night but early the next day the little girl passed away. The remaining twin boy is now on the bottle and doing well, so we’re all hoping that both he and mum can get well and back out into pasture very soon.